Quidham Place was a very early 'court' of dwellings, homes to the poorer classes, off the south side of Vicarage Street. It appears on Watt's maps of 1806 and 1831 as well as Bidder's map of 1843 and even at this time was the only built up part behind the buildings of Vicarage Street, Silver Street, and Middle Street. It was formerly known as Roll's Court and was named as late as the 1891 census as "Roll's Court (now named Quidham Place)". Quidham was a corruption of Quedam and according to Leslie Brooke in several of his esteemed publications he says the word Quedam was a corruption of the Latin word quedum meaning a ‘certain street’ or place of uncertain name. However I have in my collection a lease, dated 4 September 1794, in which Mr John Rossiter, a carpenter, leases a burgage and garden from John King, bookseller, “in a certain Street there (that is, Yeovil) called Quedam Street” inferring that it was actually the name of the street, later Vicarage Street, rather than meaning a place of uncertain name. In the 1851 census the court was home to carpenter William Parker, tailor William Bubier his wife and four daughters, widowed agricultural labourer Joseph Jefferey and his two agricultural labourer sons, railway labourer Charles Day with his wife and three lodgers, painter Charles Gregory with his wife, daughter and lodger, dressmaker Jane Reeve and a lodger, shoemaker George Gillam with his wife and four sons, pauper Anthony Cornetty with his wife and three daughters and glover Jane Brake with her sister and three lodgers. Of these people a total of 14 were in the gloving industry. Quidham Place was demolished in 1968. 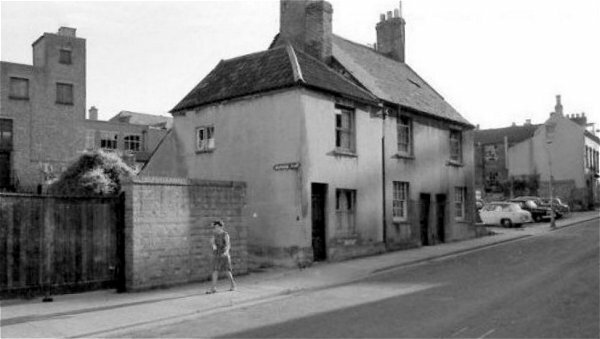 This photograph dates to about 1960 and shows the narrow entrance to Quidham Place at centre. Vicarage Street runs diagonally across the photograph. Quidham Place photographed in 1931. 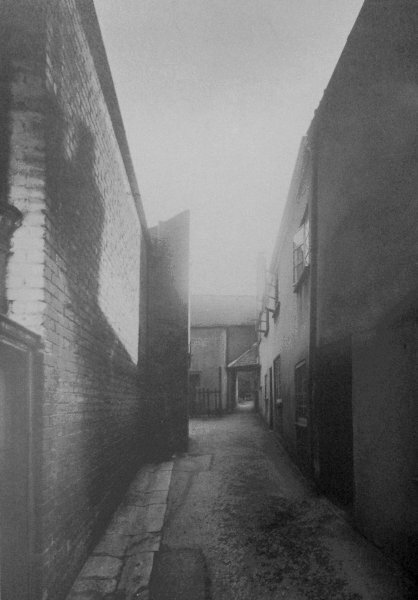 At the end of this narrow alleyway the court opened out somewhat, to the left in the photograph.